Increasing government spending, new policies that favor renewable energy, and regular incentives have driven people to invest in renewable energy stocks now more than ever. There is an ongoing debate on global warming and climate change along with increasing oil prices and how they are deteriorating the overall climate of the planet. This has forced governments around the world to introduce more ways to utilize renewable energy. For the same purpose, Finance Minister Arun Jaitley, in the Union Budget, allocated $34mn (Rs217cr) to state-owned Solar Energy Corporation of India (SECI). Increasing government spending, new policies that favor renewable energy, and regular incentives have driven people to invest in renewable energy stocks now more than ever. The three most important and emerging energy stocks you should look out for as an investor are solar energy, wind energy, and biomass energy. Here is why you should buy and keep renewable energy stocks, given the current climate scenario. One of the best reasons to buy and keep renewable energy stocks is because of the high yield and rate of return of these stocks. As the government is increasing official installation targets for renewable energy sources every year, these stocks are expected to give a higher yield in the coming years. You can predict the rise of renewable energy based on the International Energy Agency’s forecast that renewable energy generation will rise above 25% in India. 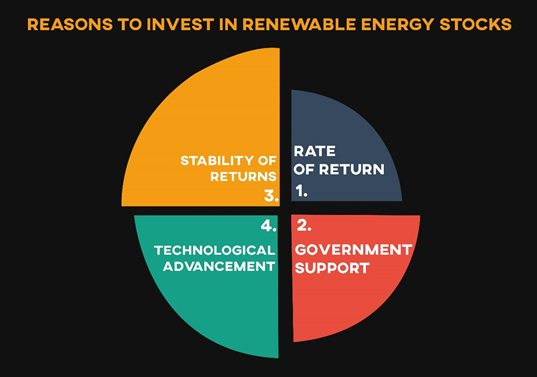 Right now, the average rate of return on a renewable energy stock is 6-8%, and it is expected that this return will go up to 10-15% in just five years. By 2040, around 49% of the total electricity will be produced by using renewable energy sources; this makes it a really good reason to keep renewable energy stocks for the future. Our government is continuously making laws and policies and providing a vast budget for the renewable energy sector. The prospect of renewable energy sector can also be understood by the fact that our government has signed the Paris climate contract which extensively includes investing in renewable energy sources. The government has understood the need to identify more renewable energy sources. With time, more and more people will also understand this need and the government will increase its budget towards this sector. Having shares of a company belonging to this sector at a time when the industry will be at its peak will let you earn massive profits. As the renewable energy sector is quite new, there is a massive scope of technological progress within this industry. New technologies are being invented to reduce the effective cost of installment, so that more people, even in the rural areas, can afford renewable energy sources. Apart from this, the government is constantly working to encourage the use of electric vehicles to decrease pollution. These technological advancements and the future scope of new technologies within the sector is why you should consider investing and keeping the shares as long as possible. The share price of these stocks is continually rising and will rise without any doubt in the future. Another good reason to keep renewable energy stocks is the stability of returns this sector provides to an investor. It is because wind and solar energy are not seasonal and are available throughout the year, and to everyone on earth. The government also provides regular incentives and subsidies to anyone who utilizes these resources, and to utilize is to increase the value of the companies of this sector. There is no doubt that the price of electricity will rise in the future as water sources are going extinct. Everyone will look for other sources to cater to their energy requirements, and this is when renewable energy stocks will be at their peak. If you currently hold shares of this sector, you should seriously consider keeping the shares for the future as this sector is the future of our earth. And if you don’t own shares of this sector, you should definitely consider buying it, as it the time when everyone is thinking of switching to renewable energy sources.